Hey! Thanks for the comments and the heads-up about the comment box! I'll be working on fixing that up, so if you run by anything weird again (or if it works for you), do let us know! 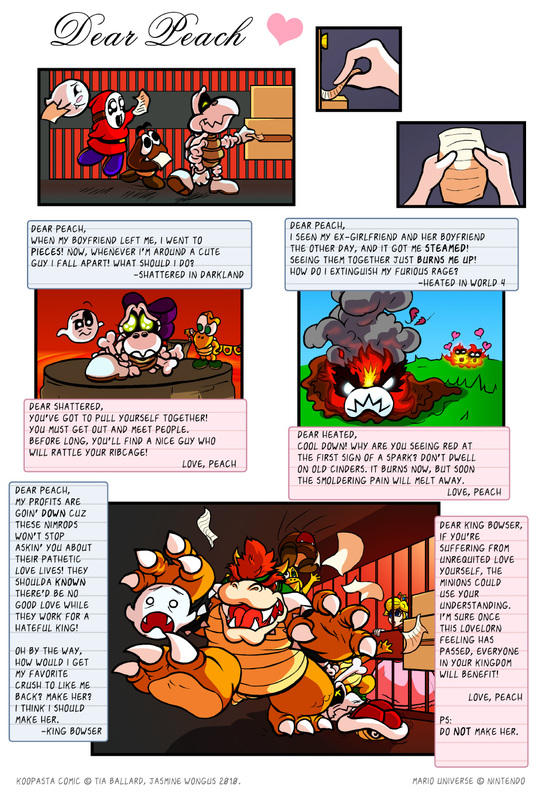 Was this homage to the Ask Peach letters pages in the old Mario comics? Absolutely! So happy you noticed!!! Peach is so sweet, replying kindly and with a tactfully intended naïvety to her ennemy and his minion's love concern. AWESOME comic, and great artwork. Miyamoto would be proud! I met you at a con a few weeks back and started to read your Mario comic. It has awesome artwork and its really well written! I hope you wrote more comics!